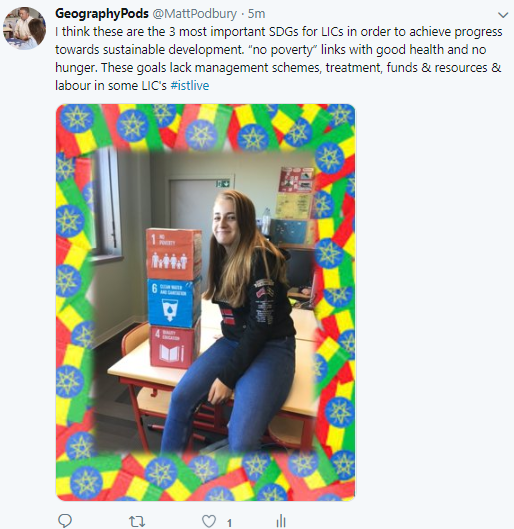 We have already carried out an analysis of the SDG's at the beginning of the course and now is a good time to briefly reexamine the attitudes towards them and how that may vary internationally. Study the two images below. Task 1 - Twitter Task. 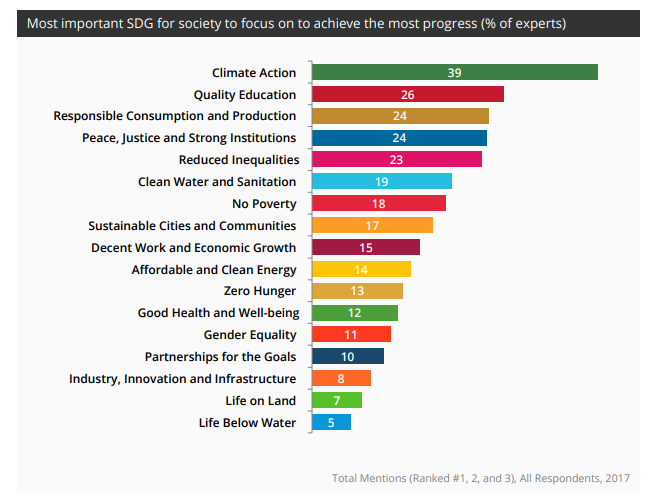 Study the first graphics: ​Which of the Sustainable Development Goals (SDGs) do you think are the most important for society to focus on in order to achieve the most progress toward sustainable development? Please choose three goals in order of importance. Have your photo taken with your cube and then in no more than 1 Tweet, explain your reasoning. Task 2 - 50 words. 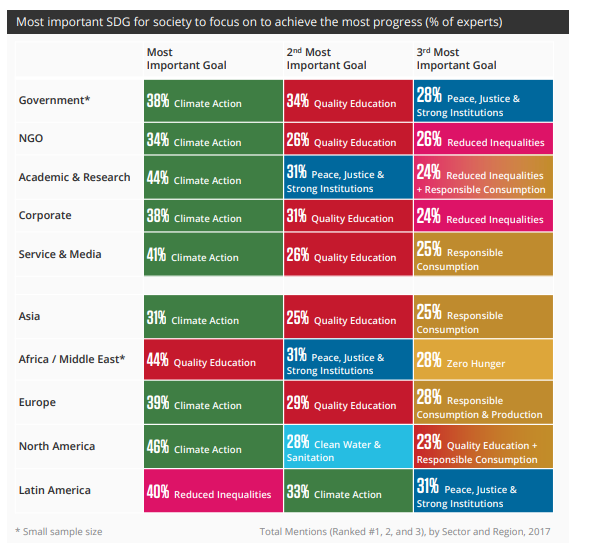 Study the second graphic above and write a 50 word summary explaining why not every region is concerned by Climate Change as their main focus. Task 1 - Watch the video to the right and use the worksheet below to complete the activities set out. 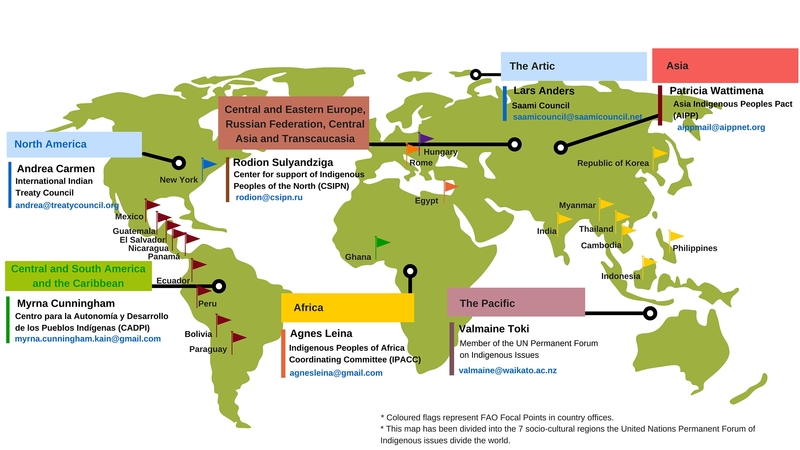 To find examples of countries at differing levels of human development, click on this link to be taken to the Wikipedia page. Data from some developing countries may not be very reliable and may be difficult to confirm. The measures chosen may seem very arbitrary to some because there are other way of measuring relative qualities in health and education. Similar criticism of GDP, that it does not measure unequal distribution within the country. I.e. continuation of wealthy students through education can hide the fact that it is difficult for children of poorer families to enter primary education. There is widespread use of HDI to compare development levels and it does reveal clear global patterns. Does not solely concentrate on economic development, and takes into consideration that there are other, more social, ways to measure human development. Increase in education and health shows an improvement in a countries infrastructure. ​It does this for as many countries as data of reasonable quality allow. It shows the loss in potential human development due to inequality between female and male achievements in these dimensions. ​It ranges from 0, where women and men fare equally, to 1, where one gender fares as poorly as possible in all measured dimensions. Task 1 - Using the worksheet below and this link, complete the first two activities set out. Study the map above and this source. Task 2 - Using both sources above, complete the associated task on the worksheet. Task 4 - Using this link, make a note of the limitations of the GII index as a composite measure of development on your worksheet. Affirmative action to close the development gap..
Educational For All Morocco from Discover Limited on Vimeo. Use the three resources above to make notes on affirmative actions taken to close the development gap. We focus on empowerment of indigenous groups in Bolivia, education for women in Morocco and the history of the LGBT movement in the USA. You may work in groups to each present and feedback an evaluation of each scheme. Make sure you make very clear the link to the closing of the development gap. How can you quantify what indigenous rights, education for girls and LBGT rights bring to a country in terms of improved development. Use the note taking sheet below to help you to focus your research. 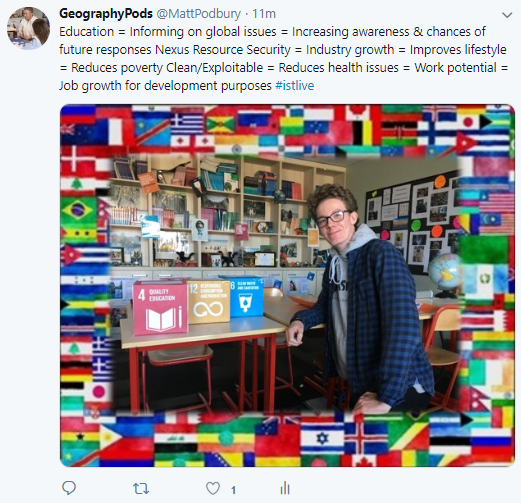 ​Task - In groups, create a 5 minute presentation and a takeaway revision resource that aims to show how social entrepreneurship can create development opportunities. Use the note taking framework above to help you to focus you research. Examine - A03 - This term requires you to make a judgment based on evidence and when relevant construct an argument. 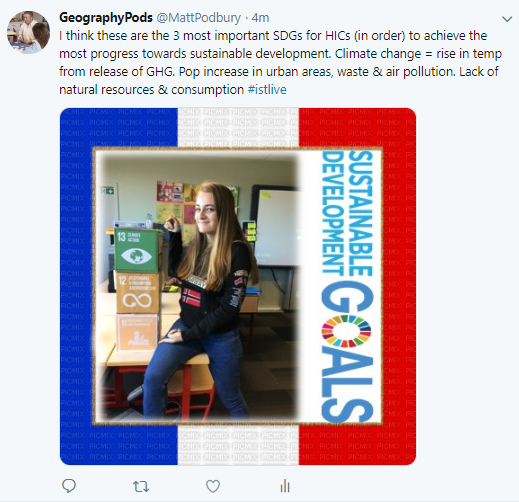 Website created for sharing resources for the #IBGeog curriculum. Created and developed by M J Podbury. CREATIVE COMMONS ATTRIBUTES APPLY 2019.